One (1) teapot / samovar ~2.75 tall. Shows wear appropriate to age and use. Dollhouse Miniatures Tableware Silver Tone Metal Toby Mug 3/8"
Dollhouse Miniatures Tableware Toby Mug. WESTRIM CRAFTS. COOKING POT -STEW POT WITH LID. DOLLHOUSE MINIATURE. COPPER COLOR. I NOTE ANY FLAWS I MIGHT FIND AND TRY NOT TO MISS ANY. MOST STUFF IS EITHER NEW OR GENTLY USED AS NOTED. I DO MY BEST TO TAKE MANY PICTURES SO YOU CAN SEE WHAT YOU ARE BUYING. For Sale is a 7 Piece, Circa 1960's, Plastic,1:12 Scale, Set of Miniature Dollhouse Pots & Pans. The Set contains : a Frying Pan, 2 Sauce Pans with Covers & a Large Cooking Pot with a Cover. All of the Pans are marked : "HONG KONG" on the bottom. Dollhouse Miniature Copper Utensil Set With Hanging Rack. 1:12 Scale. The little girl plate has a chip on the edge, as shown. These were likely made circa 1976. Display stands are not included, and they do not stand or attach to a wall on their own. You could use tacky putty. Vintage Miniature White Pitcher Embossed Cherubs Victorian Japan 3.5"
Embossed Cherubs. White Pitcher. Victorian Japan. This sale is for a miniature Solid Brass Set of a Vase (or Decanter? )., 4 Goblets and a Bottle. All are from the 1980s. They appear to be handmade but are unmarked. The goblets are about 1/2" high. , 3 red plastic spoons, 2 white plastic spoons. Pre-owned, not sure if ever used. This very old serving bowl is star shaped, from the early 1900s-20s for a dollhouse. Likely from Germany. It has a crack in the base and tarnish. Miniature Serving Bowl. Vintage Antique Dollhouse Items- Toby Mug (Japan) Urn with lid Unmarked Toby Mug is stamped Japan and Urn with Lid has no markings but has crazing so I believe it's either vintage or antique . May be a little wax on the bottoms. Dollhouse Miniature Pots & Pans Set 1:12 Scale. set 4 pots & covers. One has 50/4-160(6" total length) and the other has 50/4-145(5 1/2" in total length). Color is white with a yellow duck. These are so cute! This is either a doll house pitcher or maybe a match holde. I am no expert, but I will try to point out any obvious imperfections or major flaws. ONE (1) Miniature Dollhouse Iron Wall Mount Cooking Utensils. Miniature Dollhouse Collectibles. LC-SB-2939 (1/OZ-4x3x1) ML. Salesbaron is in Los Angeles, 90039. Hawaii and. This is a very pretty antique dish for a dollhouse! It is made of tin and painted with a purple pansy, with gilt edges. Antique Dollhouse PAINTED PURPLE FLOWER. Doll House & Play. so that I may rectify the issue. 13 piece Floral painted. See Pictures. NOT included in the item price. 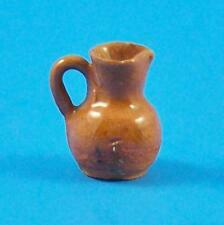 Vintage Dollhouse Miniature Red Clay Glazed Pottery Pitcher. Only 1/2" Tall. Shows very little to no signs of use! Glazed on the top portion of the pitcher down to about half of the round portion. It does have crazing! Please see pics! Please excuse glare and reflections in pics!. They have a little bit of wear and are pre-owned. This is a lovely set. Great for display. They will break might be too delicate for you child. Once paid I can not. I describe them to the best of my ability and use multiple photos to help aid you. What is pictured is what you get! I have listed a small mixed lot of Dollhouse Miniatures. The blue dishes are heavy and have made in Taiwan on them. Vintage Dollhouse Assortment of Copper Kitchen Ware / Crochet Rug / Jug etc. 1 brass and copper, covered tea kettle. 1 small copper kettle marked "Japan". They are odd bits and pieces from my great aunt's dollhouse collections. Nothing is broken but all have tarnish and wear. This sale is for a 10 piece miniature china tea set from the 1980s. It is unmarked and in 1:12 Scale. Sugar bowl lid is a tight fit. Sale is for the tea set only, no other pieces are included. (00-03F18/6). Dollhouse Miniature 8 Pc Brass Wine Set. Platter, decanter & 6 wine goblets. 1:12 scale. From the Vietnam war. Stunning in the center of your dining room table! These are unfinished, so they are perfect for customizing them to fit your decor. See pictures above. These are made by "Trunk in the Attic", back in the 1970's. Sugar Bowl with lid - 1-5/8" H x 2-1/4" W. Porcelain china. Lot of 6 Miniature Dollhouse Ceramic Pitchers and Vase 1.5" -2.5" tall Made in Japan, China, and England Some c. 1920's Condition: Due to age of items, some crazing of glaze is present. Please see pictures showing item details and condition..., . Set = One(1) Serving tray, One(1) Coffee pot/carafe, One(1) Tea Pot, One(1) Cream Pitcher, and One(1) Sugar Dish. CHECK OUT THE PICTURES, WHAT YOU SEE IS WHAT YOU GET!